Many may argue it's medicine. Others may claim that it's planes. Some may suggest the internet. Probably a lot would say it was fire. But for me the advancement that i am most grateful for in the course of humanity is the moment when some caveman or woman, somewhere in the middle of nowhere, started banging two bones together and decided that they liked the way the beat affected them. I am of course talking about music. I know in the grand scheme of things it may not be the greatest discovery made my mankind, that other things have improved the quality and length of our lives much more. But i struggle to think of one thing which improves my life more in terms of a man made affect. I'm ignoring stuff like love and friendship, which top it, because i don't believe we had a choice. It is human nature to fall in love and try and surround ourselves with friends. I reckon we had a choice with music, someone, somewhere, sometime discovered that by creating sounds they could find enjoyment. Pretty much every civilisation to exist has had music; most human beings will at some point in their life hear some form of music. Whether they're checking out the latest release of their favourite band on spotify or itunes, or listening to the tribal drumming of the elders of their tribe, their lives will encounter and in most cases be enriched by music. From a personal point of view music is my inspiration and my saviour. I've never found any interest in religion, drink can dull the pain occasionally i guess, but it is music that can lift me out of the deepest of depressions. Whether by listening to lyrics which remind me that i am not alone in feeling this pain or by hearing a riff or drum line which fills me so completely as to make thinking about whatever has got me down impossible. It brings me back to the surface when it feels a hell of a long way away. I'm a melodramatic chap (as anyone who knows me has probably grasped) and for me music is the soundtrack, the cause, the catalyst and the cure for most things in my life. Music has the power to inspire in me the most intense happiness, a kind of comfort and bliss which people strive all their life to discover. There've been times during my teenage years when i fought through hours of school i didn't want to endure, only to hear that final bell, stick my ipod in and forget for a time anything else. Lose myself in a piece of music and stop caring about my teenage dramas. I've got a corkboard full of gig tickets in my room, and every piece of paper reminds me of happy memories, nights spent in the company of great friends and great music. Memories of dancing to songs without a care in the world for the fact that i am one of the worst dancers ever to grace the planet. Memories of singing along to songs i know every word of, that mean more to me than a few well chosen words and guitar chords. 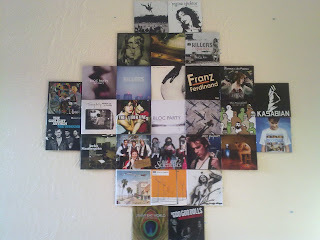 I made a kind of collage on one of my walls of a bunch of CD sleeves and i've never been more pleased with an attempt to decorate my room because every time i look at it it makes me smile for the same reasons that the cork board does. Those albums have so many memories wrapped up in them, so much emotion and importance that it seems only fitting that it decorates one of the walls of my room. It is a rare scenario where music is not in someway involved in my life. If i'm in my room then i will have music on, unless i'm watching a film or it's the 15 minutes before i fall asleep. If i'm out on my own then i'll have my ipod in. If i'm with friends then there is almost certainly some set of lyrics or some section of tune bouncing around my head. When i run, i run without an ipod, but i find my breathing ends up being in time with the song filling my mind. I analyse everything, try to find meaning in every miniscule moment, and often, due to the less desirable aspects of my personality, i find reasons to be sad in most things. But music, it frustrates that side of me. Even the most depressing song moves me in a way that i find impossible to view as negative. I fell in love with music at an early age and it's a love that's lasted, without a sign of faltering or fading. One reason behind my certainty that no matter what else happens in my life, i will still love music, is the fact that is limitless. It is a constantly evolving thing, every day someone somewhere picks up an instrument for the first time, with dreams of creating something that someone might enjoy. Sadly i was never gifted with much potential for creating music, but i will accept my failings as a creator so long as i can continue to enjoy listening to it so much. The list of things that matter to me as much as music can literally be listed on one hand, and that is a testament in itself to it's importance. There's a quote from a song that annabel once told me about, a quote that i believe means quite a lot to her, which seems kind of fitting as an ending note here. "music is my first love, it will always be my last"